Over 90,000 pounds of HEB ground beef products have been recalled by the U.S. Department of Agriculture after four consumers complained of metal in their ground beef, which was shipped from Sam Kane Beef Processing in Corpus Christi. Three-pound packages of “HEB Ground Chuck" with the location identification number 337. Five-pound packages of “HEB Ground Beef” with 73 to 29 percent lean-to-fat ratio and the identification number 337 and a production date of Sept. 15, 2014 and a use by date of Oct. 5, 2014. 10-pound packages of “HEB Ground Beef” with 73 to 29 percent lean-to-fat ratio and the identification number 337 and a production date of Sept. 18, 2014 and a use by date of Oct. 8, 2014. 10-pound packages of pre-formed patties with the identification number 337 and a production date of Sept. 9, 2014 and a use by date of Sept. 29, 2014. Sam Kane Beef Processors is recalling more than 90,987 pounds of ground beef that may be contaminated with pieces of metal. 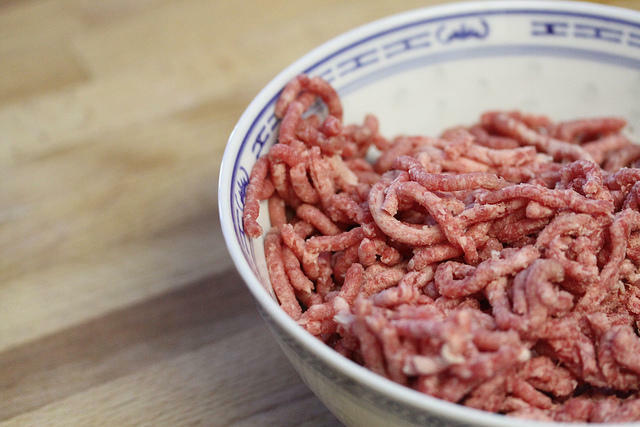 The recall happened after a store received consumer complaints that involved ground beef and pieces of metal, approximately three millimeters in size, being found in the products. Another customer complained of illness after eating the contaminated beef, and another complained of a chipped tooth. The USDA is urging those who fear they may have injury or illness as a result of eating the beef to seek immediate medical assistance. Consumers with questions, complaints or information should call (361) 241-5000 Ext. 250. H-E-B has issued a voluntarily recall of 13 items due to the "possible presence of a foreign material." The San Antonio-based grocer said no customers have reported illnesses, but they recalled certain skirt steaks, beef fajitas and stew meats with packaging dates as early as June 9 as a precautionary measure. Below is a full list of affected items.